Girls Night Out - Come Sing With Us! We are currently auditioning for new singers. Please come join us. The Chinook Winds Show Chorus has an open door policy and invite you to drop in and see us on any Tuesday night. Our rehearsals run from 7 pm to 10 pm. During your first visit, you will be invited to join us on the risers for vocal warmup and other exercises. That way, you will be able to tell quickly if this is the chorus for you. Our friendly and knowledgeable membership committee ([email protected]) will give you all the information you need regarding audition procedures, membership fees, costumes, makeup, performances - anything you want to know. Our members are also happy to answer any questions you may have - we are always happy to see new faces on the risers, and it's important to us that you feel welcome and comfortable as a visitor or new member. 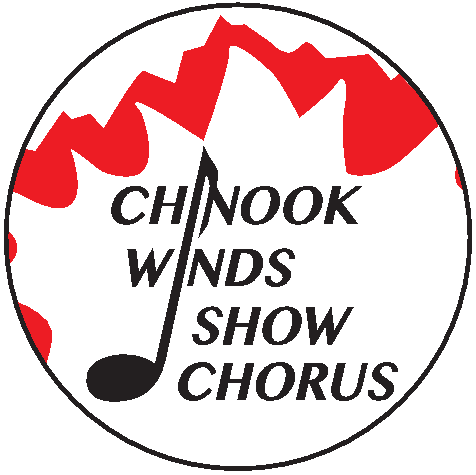 Your first 6 weeks are always free and during this time you'll have the chance to get to know the chorus, receive vocal instructions and tips, learn a song or two, and, if you choose, audition to become a full-fledged member of Chinook Winds Show Chorus! The benefits of singing and being a "Sweet Adeline" are many. First and foremost, you will develop your musical and vocal skills and become a better singer. You'll learn about choreography, costuming and everything surrounding show production, and you may choose to become as involved as you like. Some of our members are very involved in management, marketing, and education, but this is not mandatory. Some just come to sing - and that is perfectly alright! We rehearse Tuesday Nights from 7:00-10:00. Visitors are welcome, and we encourage you to drop by!